This year, however, a good friend and co-worker invited me over to his house to watch the Super Bowl, so I thought I would give it another shot. I am no fan whatsoever of the New England Patriots, but I did appreciate the Seattle Seahawks taking down Peyton Manning last year, so deciding which team to root for was a fairly easy choice to make. Maybe one day, I’ll explain the dislike I expressed in that last sentence, but that’s probably another post for another time. By now, primitive tribes in the deepest heart of Africa probably know how the game ended, but just in case you don’t, here it is in a nutshell: Seattle has the ball on the 1-yard line with 24 seconds left in the game and decides to run a pass play, despite having three downs to get the ball into the end zone and Marshawn Lynch, one of the most feared running backs in the NFL, in their backfield. Patriots intercept the pass, massive brawl breaks out on the next play, Patriots get to move the ball out of the end zone, take a knee, game over. I may have mentioned a dislike for Peyton Manning earlier, but I’ll give the guy credit for one thing: He controls his own game. Why in the world Seattle quarterback Russell Wilson didn’t audible out of that play the second it was called in to him is beyond me. Since he didn’t, though, that only leaves one person to blame – Seahawks Head Coach Pete Carroll. One of the things that has always fascinated me about professional sports is the almost insanely high confidence level of the people who coach and play them. Did Carroll back down from the call he made at all? Nope. Not in the least. “We had a terrific call, but it didn’t work out,” he told a reporter after the game. The man actually used the word terrific. Even if I did not regret my decision one iota in that instance, I would never, ever use the word terrific. Terrific calls win games. No, Coach, this was not terrific. As I was driving home from my friend’s house, I began thinking about how I would respond to making a bad play call like that, one so completely wrong that it cost my team the goal it had been working toward the entire season. My conclusion didn’t take much thinking, because I know myself; I would still be on television, radio, the internet, whatever, apologizing to anyone who would listen to me and self-flagellating myself to an endless degree. I don’t know if I could call another play again. I might just leave football altogether. Yet, there was Carroll, a man who has won a collegiate national championship and a Super Bowl, talking about his “terrific” play call immediately after his team lost the big game. Where does that confidence come from? Is it born out of a complete aversion to reality, or is it the makeup of someone who is completely comfortable in their own skin and able to live with their own decisions? I grew up believing that type of confidence was pure arrogance and should be avoided at all costs, and in many instances it is and it should be. There is a definite elasticity to it, though, which allows people to shake off their mistakes and move on to whatever happens next. 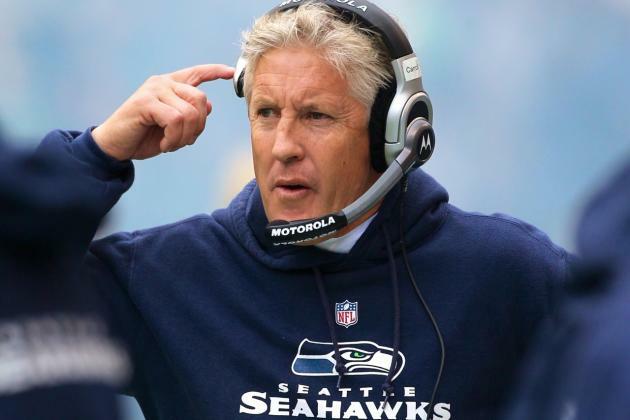 Before anyone thinks I’ve lost my mind, I’m not advocating that we all try to be more like Pete Carroll, because most of the time I think the guy is a pompous jerk. What I am saying is, we could probably all stand to go a little easier on ourselves and not wreck ourselves over every mistake we make. Yes, professional athletes and coaches sometimes display irrationally high levels of confidence, but they’re able to move on to the next play, the next possession, the next game. I guess, in a weird way, I do want to be more like Pete Carroll.